Taking care of your heater might not seem like something you need to do during summer, especially in the Orlando area. However, there are a few important reasons to have maintenance done on your heating system, even when it’s hot out. Find out more about why you should put this on your to do list this season. Caring for your heating system during summer helps reduce the risk of needing emergency repairs in winter. Routine maintenance on your heater keeps it in good condition, so that it will be less likely to act up when you’re trying to heat your home. If HVAC technicians find any evidence of even minor problems, they can take care of them now instead of waiting until they become major problems. Before you start using your heating system in winter, you need to have it checked and make sure that it’s all set to run. Neglecting your heating system means that you might have to do some last-minute repairs or maintenance when winter has already started. Taking care of your heater in summer helps ensure that it’s fully prepared to handle all of your heating needs when the weather gets colder. Keep in mind that you should put a new air filter in your heating system before you start using it, which is a task you can easily take care of in summer. Having an HVAC technician come out to your home during summer to inspect your heating system and tune it up is an easier and more convenient task than having this done in winter. 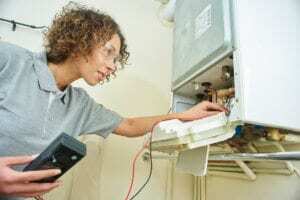 The technician can get right to work rather than having to wait until your furnace cools down. You also don’t have to worry about going without heat in your home while the technician handles maintenance tasks. If your heating system needs maintenance this summer, please contact Rinaldi’s Energy Solutions. Our team can make sure that your heater is in good condition, so that it will be ready for you to use when the weather gets cooler.